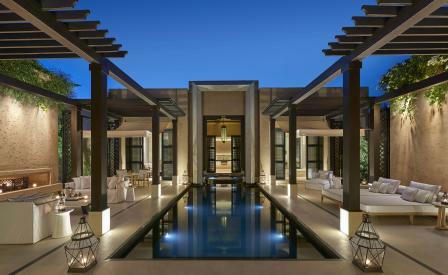 The Mandarin Oriental group have set foot in Africa with a property in Marrakech, just 10 minutes’ drive from the medina. Designed by French duo Gilles and Boissier - also behind the slick New York Baccarat Hotel and Parisian Hexagone restaurant - the hotel’s décor is in keeping with the group’s signature linear East Asian style, while subtle Berber and Andalusian touches add a hint of spice. 54 villas with private pools are scattered across a fragrant garden of 100,000 roses while nine suites in the main building come with plunge pools that look out to the snow-capped Atlas mountains. Three restaurants - from traditional Moroccan to Mediterranean - have all gastronomic requirements covered, while the spa, offering exclusive massage suites, has two hammams, an indoor pool and an option to enjoy outdoor treatments under the shade of the olive trees in the adjacent garden.